This expansion book for The Esoterrorists (which is also useful for other GUMSHOE-games) clocks in at 44 pages, 1 page front cover, 1 page editorial, 1 page ToC, leaving us with 41 pages of content, so let’s take a look! So, first things first – since I’m trying to help retain this review’s usefulness for folks not familiar with esoterrorists: The idea of this horror-game is pretty much brilliant. The PCs are part of a conspiracy, the Ordo Veritatis – and it is actually a benign one. You see, our world sports a membrane that separates us from the Outer Dark, a place of chaotic and infinite possibilities, pretty much all of which are horrific nightmare fuel – think of it as the desert of the real, as the horrific, chthonic truth of reality, where science and the laws of physics break down. Here’s the thing – the membrane isn’t a wall – it is elastic, regenerates slowly and can be ripped, torn…and it may be the collective unconscious of our species. For as long as we *believe* in ordered reality, for as long as we cling to hope, to a sense of the world…well, making sense, the membrane will protect us from the Outer Dark. Conversely, despair, a sense that life’s surreal and an experience of Entfremdung from existence, the glorification of dark deeds, horrific superstitions that gain traction and similar proceedings ultimately weaken the membrane. There is a second conspiracy, but it is not a structured hierarchy; instead, it is a cluster of infinite cells – the esoterrorists. Their end-game is to break down the membrane and welcome the entities of the Outer Dark to our reality – for whatever purposes. Esoterrorists perform horrific deeds and ultimately are enemies of all mankind – with the horrific prospect of their sheer existence being a weapon. If the truth of the Outer Dark existing becomes widely known, said knowledge alone will greatly diminish the membrane, potentially breaking it. Hence, the Ordo Veritatis’ (or OV) goal is to keep the public ignorant of the horrific struggle, the shadow war waged behind the scenes. The esoterrorist’s main advantage in the struggle against the superb organization of the OV, however, lies in their command of magic…or rather, in their ability to summon the dread entities from the Outer Dark, who have…well, really nasty tricks up their sleeves. This book, then, would constitute essentially a massive dossier for the agents of the OV – written in-character, as though it was a need-to-know-basis briefing file, this book elucidates upon the various types of summoning at the disposal of the esoterrorists and the current theories pertaining the mechanics of said summoning. In the beginning, the paradigm shift for the OV’s endgame, from the overly ambitious eradication to containment, is explained in succinct and captivating detail. Similarly, the current theories pertaining the membrane provide a concise picture o the stakes of this conflict – it is against the backdrop of new media and a progressively more daunting task that we are introduced to the different types of summoning techniques the esoterrorists employ. The first of these would be the Greater Invocative Summoning, and it may be the most hard to pull off, but also the most powerful technique: It requires a significant amount of people (we’re talking thousands) and the considerable psychic energy these individuals generate; as such, it is easy to spot and anticipate, but actually preventing it while maintaining anonymity and ignorance of the OD (Outer Dark) entities is VERY hard; the danger this type of summing poses, though, is considerable, for it can draw a new OD entity to the world – and after an entity has been clad in our reality’s nightmares, after it has manifested once, it can be called in a significantly easier manner – less expenditure, less elaborate requirements – basically, it thereafter can be called forth via a lesser invocative summoning. This summoning, in short, can establish a foothold for an entity or type of entities. Following the formula, we get case studies pertaining such summoning rituals as well as suggested countermeasures for the OV agents…always remember, in the end, you need plausible deniability, mundane explanations for the proceedings to enact a proper veil-out. Ontological summoning is different – it capitalizes on the previously noted power of folk belief; basically, a belief is taken and continuously reinforced by the esoterrorists, who seek to make the folk belief seem plausible, like the surreal, reality eroding truth. That factory, where Freddy Krüger died? Making kids disappear in the vicinity, seeding sightings and fostering fear and angst in the face of the obvious evidence are what allow entities called forth thus to assume appropriate shapes. Thirdly, constructionist summoning would be the Frankenstein approach – the mad scientist creating a flesh-golem, the programmer seeking to make an evil A.I.-god, the brainwashing cult that seeks to create a monument – basically, here, it is not belief that generates a vessel, but actual construction and belief in the receptacle. Speaking of cults – there is one more and particularly grotesque way of bringing an OD into the world: The total destruction of a personality with impositional summoning. Basically, esoterrorists completely break down a person’s self and instill a belief in the target that the person was destined to be a vessel or actually IS the Outer Dark entity (ODE)…until it supplants the unfortunate being, overriding everything and becoming, for all intents and purposes, the ODE. It should be noted that this can also generate a means in ingress for new ODEs… and the case studies featured here are particularly brutal. Finally, there would be opportunistic summoning, which is basically grounded in finding cryptid-sightings, LSMs (Low Membrane-Strength places) as well as similar places and establishing contact with ODEs. Speaking of which – the issue of negotiating with such entities, when and where it is permissible and when it is appropriate, is also depicted in detail: Basically, the agents are given guidelines to deal with the alien psyches and easy tools to evaluate whether it is possible to defeat the entity sans giving in to demands, when and how such strategies are valid and the different demands are indeed covered as well. prolonged negotiation and the potential stability loss that entails. Now, what to do with all the knowledge this pdf provides for the agents and GM? Well, there would be an interesting sample scenario that takes up the last couple of pages, one called Cell Death. The following will cover the basics of this investigation, so potential players of the scenario should skip ahead to the conclusion. From here on out reign the SPOILERS. All right, still here? The agents are sent to Rome, where Lucio Mancini lies dying in a hospice ward, asking for Mr. Verity and the “pluggers” – esoterrorist slang for agents of the OV plugging the membrane. Mancini’s wife died of an inoperable lung condition, caused by toxic smoke, which made him slip into esoterrorism and now he’s riddled with cancers and has one request from the agents of the OV – find is son, who has gone underground. Introduced to the esoterrorist cell of one Graham park, Mancini does not want his son to pay the ultimate price as well. It is from here that the PCs track the trail of Lucio’s son to the sleepy backwater town Bluewater in Idaho. Here, different types of potential summoning endeavors can be eliminated, one by one, until impositional summoning is left – and indeed, in a well-guarded farm, the esoterrorists have not only established a security perimeter of concealed cameras and the like – they also have a subterranean bunker complex, where Lucio’s son’s personality was systematically broken down: He witnessed, time and again, as radiation and toxic smoke corroded and gruesomely slew people in front him, while he was unaffected – thus nearing the completion of the summoning of a new ODE, the balefire man, a really nasty ODE whose stats btw. are provided herein. The problems faced by the agents consist of more than just dealing with the armed esoterrorists, though – they have to find the bunker complex and hopefully, via mementos, gain an edge in combat against the dread entity. Similarly, the hazmat suits the PCs can find certainly will be helpful when dealing with the ODE…which brings me to a bit of an issue I have with this scenario. While it is permissible for OV agents to eliminate esoterrorists, the perhaps smartest way of dealing with those in the inner vault would be rigging poison gas to it, flooding the bunker – the pdf very much acknowledges this. The PCs arrive as the remaining esoterrorists give their lives and call forth the ODE – something that cannot, RAW, be prevented, which I get from a dramatic perspective. However, poisoning the unarmed ritual practicing esoterrorists frankly violates the code of ethics and could act as a catalyst to bringing forth the balefire man – after all, it is established that a good man’s evil deeds weaken the membrane more than that of a conscience-less psychopath. So yeah, that aspect of an otherwise good module would constitute an internal logic issue in my book. On the plus-side for the battered agents if they take down the ODE, the veil-out should be easy thanks to the secluded nature of the farm. Editing and formatting are very good from both a rules-language and formal perspective. Layout adheres to a nice 2-column b/w-standard that emulates papers and dossiers, with photo-like, amazing b/w-artworks as well as excellent b/w-drawings emulating a “clipped in/attached” feeling – the layout conveys well the illusion of reading a proper dossier. The pdf comes fully bookmarked for your convenience. 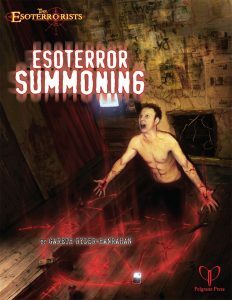 Gareth Ryder-Hanrahan’s Esoterror Summoning Guide represents an amazing resource; the fact that you can hand it to your players and just have them read the book(and enjoy the experience) renders this not only a great handout, it also makes the subject matter, which could have been dry and bland, thoroughly exciting. Each of the ample case studies can act as a great adventure hook to build new scenarios from, so that’s another plus. In fact, the summoning-type categories, obviously also are relevant for Fear Itself and can be employed beyond that game: The general ideas for various types of summoning can conceivably be equally easily used in the context of Trail of Cthulhu or Night’s Black agents, particularly if you’re running a genre-spanning game that features elements from multiple GUMSHOE-settings. I similarly absolutely enjoyed the final scenario attached, which does a great job of showing GMs and players alike how to employ the knowledge they and their PCs have in game; that being said, the denouement and climax of the module, to be, was a bit of a dud, since the potential code of ethics violation and the lack of diversified outcomes made this more railroady than required and slightly less refined to me. let it be known, however, that I am complaining at a very high level here – I still consider this to be an excellent purchase and well worth of a final verdict of 4.5 stars, rounded up for the purpose of this platform.